A native of Northeast Ohio, Dr. Biswas completed his undergraduate studies at Cornell University in Ithaca, New York and later earned his Medical Degree from the Yale University School of Medicine in New Haven, CT. As a medical student at Yale, the opportunity to care for patients experiencing disabling pain and injuries compelled Dr. Biswas to pursue a career in Orthopaedic Surgery. Under the direction of internationally recognized authorities in musculoskeletal surgery, Dr. Biswas completed his residency training in Orthopaedic Surgery at Rush University Medical Center in Chicago, IL. During his residency training, Dr. Biswas appreciated the profound impact of disorders and injuries affecting the upper extremity on the lifestyle and livelihoods of patients. The ability to care for these conditions as well as the challenge of mastering the procedures and proficiencies required to treat them inspired Dr. Biswas to consider a career in hand surgery. 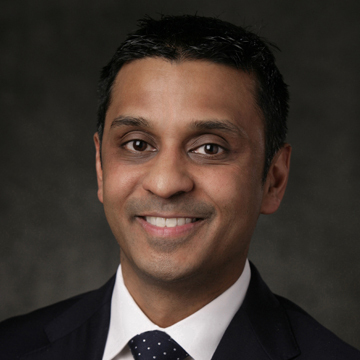 After residency, Dr. Biswas pursued further subspecialty fellowship training in hand and microvascular surgery at the University of Washington and Harborview Medical Center in Seattle, Washington, one of the world’s busiest and highly regarded tertiary referral centers for hand disorders and upper extremity trauma. Dr. Biswas is a board-certified Orthopaedic Surgeon and holds additional subspecialty certification in surgery of the hand and upper extremity by the American Board of Orthopaedic Surgery. His practice is focused on the surgical treatment of disorders and injuries affecting the hand, wrist and elbow. After several years of clinical practice in the Chicago suburbs, he was recruited to join Ortho Illinois in 2019. Dr. Biswas takes pride in involving his patients in shared decision making. He emphasizes non-operative management whenever possible. When surgery is considered, Dr. Biswas and his staff take pride in guiding and counseling patients during their preoperative and postoperative experiences and ensuring optimal clinical outcomes. Dr. Biswas’ mission is to provide expertise and clinical care that would be available at any of the nation’s leading hand centers. He is committed to providing compassionate, world-class hand and upper extremity care to the patients of Ortho Illinois. Dr. Biswas and Ortho Illinois accept multiple insurance providers. To see a list of insurances accepted click here. Contact your insurance carrier for your specific plan details.